Funeral of civilian killed in a suicide attack in Kabul, Afghanistan, June 2018. 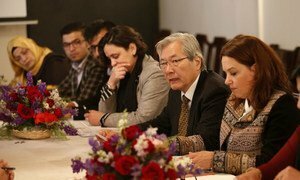 The UN mission in the country has reported that a record number of Afghan civilians were killed by warring parties in the first half of 2018. The number of civilians killed in Afghanistan hit a record high in the first half of the year, despite last month’s unprecedented ceasefire between the Afghan Government and the Taliban, the United Nations reported on Sunday. According to the latest figures released on Sunday by the UN Assistance Mission in Afghanistan, known as UNAMA, there were 5,122 civilian casualties (1,692 deaths and 3,430 injured) in the first six months of 2018 – a three per cent overall decrease in casualties from last year. But civilian deaths were up by one per cent, the most recorded in the same time period since UNAMA began documenting civilian casualties in 2009. The continuing record-high casualty rates are being inflicted on civilians despite the unilateral ceasefires by the Government and Taliban that occurred over the Eid al-Fitr holiday period between 15-17 June 2018. Ground engagements were the second leading cause of civilian casualties, followed by targeted and deliberate killings, aerial operations, and explosive remnants of war. Civilians living in the provinces of Kabul, Nangarhar, Faryab, Helmand and Kandahar were the most impacted by the conflict. The full UNAMA Protection of Civilians in Armed Conflict 2018 mid-year can be found here.